A student project that explored the migratory effects caused by drug violence along the U.S.-Mexico border and a comprehensive reporting package on the ongoing development of Paraná state in Brazil won the Online News Association’s 2012 awards for non-English projects during the ONA’s latest conference in San Francisco. 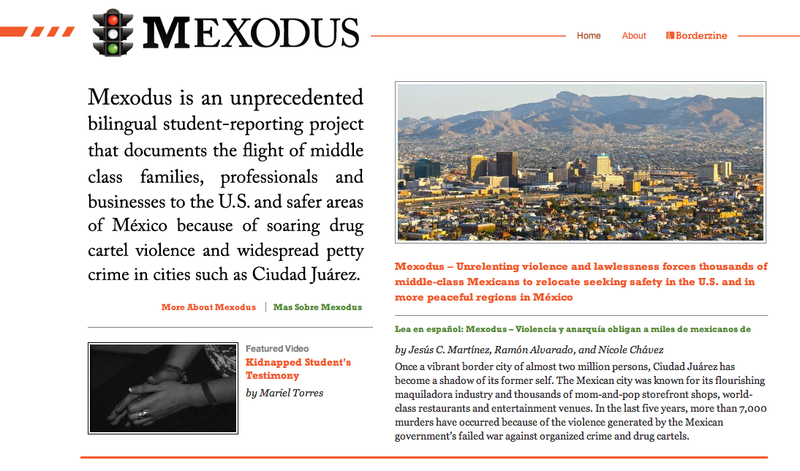 “Mexodus,” published by Borderzine, a bilingual student publication of the University of Texas in El Paso, aimed to document the flight of families and businesses from Ciudad Juárez, Mexico to its sister city of El Paso, Texas. The mass migration followed a surge in drug violence and petty crime in the Mexican border city. Students from four universities in Mexico and the U.S. contributed to the nine-month project and published around 20 stories in both Spanish and English. “Retratos Paraná,” published by the Curitiba-based daily Gazeta de Povo was a four-month project in which a team of journalists traveled across more than 6,200 miles in the Brazilian southern state of Paraná to paint a detailed picture of the developing region. The series, which included several features and interactive maps, examined the state through the lenses of economics, health, education, urban mobilization and culture to show the different faces of progress and poverty in Paraná. A third non-English award, for General Excellence, was received by Rue89, an innovative web-only publication from France. ONA’s conference this year was held from Sep. 20 to 22. Its Online Journalism Awards seek to recognize outstanding work in digital journalism each year. Winners in other categories this year include Homicide Watch, which won the Knight Award for Public Service; The Globe and Mail, which won the Feature, Medium Award; and the New York Times, which won, among other awards, the General Excellence in Online Journalism, Large Award.